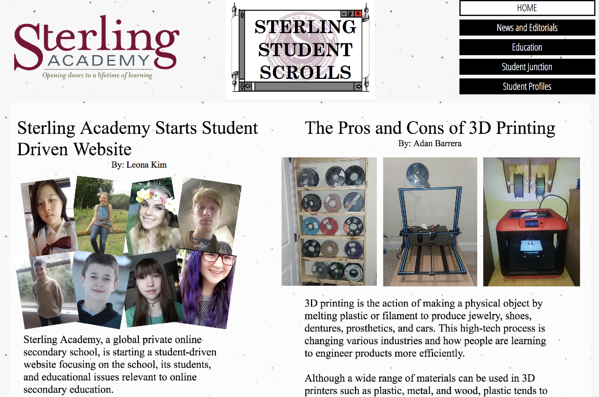 Have questions about Sterling Academy? Samuel D. (North Carolina), wrote this while in 11th grade at our school. He has graduated from Sterling Academy. I am enjoying the courses much better than when I was in public school. In fact, I have learned more in one year in Sterling Academy than in three years of public middle school and two and a half years of public high school. Rebecca M. (Texas), wrote this while in the 10th grade at our school. She has graduated from Sterling Academy. When I first started at Sterling Academy, I thought it was going to be a piece of cake, like everyone else does. I was wrong. Doing an online school consists of serious personal dedication. I thought it was going to be a walk in the park but if you don't dedicate yourself to it, it'll be a struggle the whole way. When I finally realized this for myself, I started doing very well. I started by waking up at a certain time Monday-Friday. I woke up at 8. It was easy because I took my mom to work at 8:15 and when I got back, I'd start on school and stay on it until 12:15. At that time, I would go meet my mom for lunch. After lunch I would finish the classes that I had not gotten to before lunch. Completing an entire section each day was time consuming but it is totally worth it. When I finished that last class, usually around 4, I got to relax before I went to get my mom at 5 from work. Although, those were how my days went when I wasn't working. 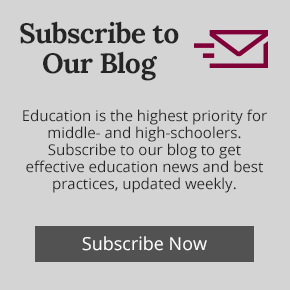 Some people think that if you're homeschooled, you have all the time in the world to do your work, even if you have a job; that is not the case. It's the same as going to an actual school [building]. When I did have to work, I had to wake up earlier to get at least one and a half classes done before I went in. Or I would do an extra day of class or two the night before so I wouldn't have to be up super late working on it. I never realized this when I went to public school, but even there if you want to get anything done and graduate, you have to have self-discipline and determination -- no matter what type of school you go to. I will admit I always complained about my teachers in public school -- mainly because I didn't get one-on-one time so I could really understand the material. When I switched to this school, my opinion changed. The teachers I had were very helpful and patient with me. Especially my math teacher, Mrs. Grant. Math is my hardest subject and she helped me so much. DO NOT hesitate to ask your teachers for help. These teachers are wonderful and their job is to help you. I can honestly say that making the switch to Sterling Academy was the best move for my academic career. 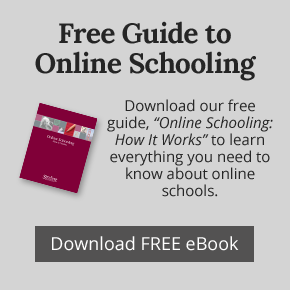 You're given the chance to have a wonderful online private school education. Take it and use all the resources you are given. Sterling Academy challenged my son Henry more than the private Christian school he attended as well as the 5 star public school he attended 9th and 10th grade. He is proud to be a graduate of Sterling Academy and we recommend it to anyone looking for an alternative learning program. We feel he is qualified to apply to any college or university of his choosing with the confidence that he will be accepted. Public education wasn't working for Mark in more ways than one. I was torn with several decisions regarding his education. I am glad that I chose Sterling, the educators are proficient, well rounded, and know their stuff! The administrators [at Miranda's new school] were asking me about your program, because they were wondering how it worked, and I expressed my enthusiasm for the way Sterling had taught Miranda and how the teachers were always available to help her out when necessary either by email or by phone. I explained what a great program it was for Miranda for her to work online, and how she was still able to meet friends online and one of those friends is her best friend today. Thank you for all that you have done, and who knows I still may need you again in the future for great nephews and other children I know. I highly recommend Sterling Academy as an online school! We have two boys enrolled at Sterling Academy. Sterling Academy has been a great tool in the education of our children. The teachers seem to care and respond in a timely manner. The course material is excellent in keeping our children interested. I always love to hear stories from my children about what they have learned. We have had a wonderful experience at Sterling Academy.